Asian stocks finished on a mixed note on Friday as rising bond yields and mixed earnings from top U.S. companies helped induce some caution ahead of the closely watched U.S. monthly jobs report for January. Chinese stocks reversed initial losses to end higher as investors looked ahead to the release of January trade and inflation numbers next week for further clues on the economic outlook. The benchmark Shanghai Composite index rose 15.96 points or 0.5 percent to 3,462.96 but posted its worst weekly loss in 14 months. Hong Kong’s Hang Seng Index edged down 40.31 points or 0.1 percent to 32,601.78. Japanese shares fell, dragged down by banks after the Bank of Japan upped bond purchases as part of efforts to prevent bond yields from rising. 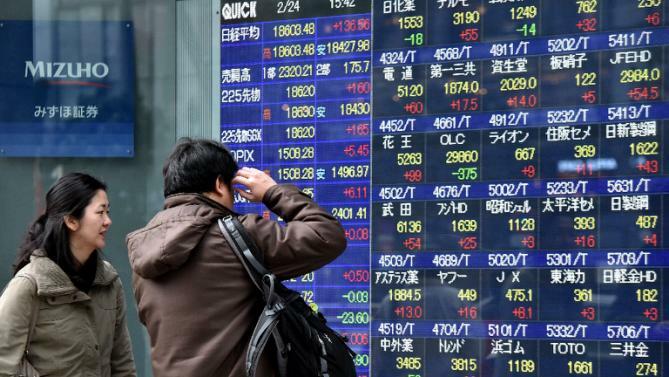 The benchmark Nikkei 225 Index slumped 211.58 points or 0.90 percent to finish at 23,274.53, while the broader Topix Index closed 0.3 percent lower at 1,864.20. Banks Mitsubishi UFJ Financial Group, Sumitomo Mitsui Financial Group and Mizuho Financial Group all ended down over 1 percent. Kyocera Corp plunged 6.6 percent after slashing its annual profit guidance. Ricoh jumped 11.3 percent after the imaging and electronics company raised its full-year forecast. Likewise, Kobe Steel soared 5.8 percent after saying it expects to swing back into profit in fiscal 2017. Meanwhile, Australian shares recovered from a weak start to end solidly higher as firmer iron ore and oil prices helped lift mining and energy stocks. The benchmark S&P/ASX200 index rose 31.30 points or 0.5 percent to 6,121.40, while the broader All Ordinaries Index gained half a percent to finish at 6,229.80. Energy majors Woodside Petroleum, Oil Search, Origin Energy and Santos climbed 2-4 percent after Goldman Sachs raised its three-month Brent crude forecast to $75 a barrel and its six-month forecast to $82.50 a barrel. Miners BHP Billiton, Rio Tinto and Fortescue Metals Group rose between half a percent and 0.8 percent. James Hardie Industries soared 6.8 percent after the building materials supplier raised the low end of its full-year operating profit outlook. Telecom giant Telstra Corp. added 0.8 percent after announcing it would incur an impairment charge of $273 million in its first-half results. Realty stocks fell broadly amid the ongoing sell-off in global bond markets on worries about rising interest rates.